APIA (AFP) – Dozens of aftershocks rocked the South Pacific Wednesday, 24 hours after a huge earthquake churned up towering tsunamis that killed at least 113 people when they wiped out villages and flattened tourist resorts. Huge waves that witnesses and officials said measured between three and 7.5 metres high pounded the remote Pacific islands of Samoa and Western Samoa after an 8.0-magnitude undersea quake struck early Tuesday. While the quake toppled buildings and sent thousands fleeing to high ground as the tsunami approached, many others were hit by the walls of water that swept people and cars out to sea and obliterated coastal settlements. US President Barack Obama called the incident in the outlying US territory of American Samoa a "major disaster" and vowed "aggressive" action to help survivors. "My deepest sympathies are with the families who lost loved ones and many people who have been affected by the earthquake and the tsunami," Obama added. Samoa's Prime Minister Tuilaepa Sailele Malielegaoi said he was "shocked beyond belief." The tsunamis swept across the Pacific, battering Samoa where hospital workers said it killed at least 84 people, American Samoa where it felled 22, and Tonga, where at least seven people died. Up to 70 villages stood in the way of the waves in the worst-hit area and each housed from 300-800 people, local journalist Jona Tuiletufuga told AFP. Nine members of one family were killed in the village of Lalomanu on the south-east of Samoa, a relative said. "My family own the Taufua Beach Fales and we have confirmation that nine members of our family have perished, four of them children and many more missing," the bereaved relative told Australia's public broadcaster. "The tourists haven't been accounted for either." Amateur video footage showed villages that had been completely obliterated, homes reduced to shards of metal and wood, while cars were stuck in treetops where they had been hurled by the force of the tsunami. 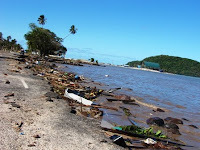 Samoa's deputy prime minister Misa Telefoni said his tiny country's tourism hotspot was "devastated" by the tsunami which left residents and holidaymakers with little time to flee. "We've heard that most of the resorts are totally devastated on that side of the island. We've had a pretty grim picture painted of all that coast," he said. Two of the country's most popular resorts, Sinalei Reef Resort and Coconuts Beach Resort, off the west coast of the main island of Upolu, had been hit hard, he told AAP. Australia said at least three of its citizens, including a six-year-old girl, had died. Seoul said two Koreans were killed, while one person from New Zealand was also feared dead. Officials in American Samoa, about 100 kilometres from Samoa, said the death toll of 22 was expected to climb. "It could take a week or so before we know the full extent," Michael Sala, Homeland Security director in American Samoa, told AFP. Waves around 25 feet (7.5-metres) high did most of the damage as they swept ashore about 20 minutes after the earthquake, demolishing buildings in coastal areas, he said. Witnesses said cars were swept out to sea and buildings were destroyed in what the US territory's Congress delegate said was a scene of "devastation." The eastern part of the island was without power and water supplies after the devastating earthquake, which struck at 6:48 am Tuesday (1748 GMT) at a depth of 18 kilometres (11 miles), 195 kilometres south of Apia. The US Geological Survey (USGS) continued to report dozens of moderate aftershocks in the vicinity of the major quake, including a 5.2-magnitude quake that struck almost exactly 24 hours after the first. The agency said the aftershock, which hit at 1747 GMT Wednesday, had been shallow -- 10 kilometres below the surface -- and was centred 255 kilometres southwest of Apia. The United States, Australia and New Zealand all made preparations to send emergency help to the ravaged region that is home to more than 241,000 people. The United Nations said Wednesday it was sending an emergency team to Samoa. The UN Office for the Coordination of Humanitarian Affairs was dispatching an emergency team to the Pacific territory and the UN system was mobilizing to provide aid, a statement said.